Bree Tanner can barely remember life before she had uncannily powerful senses, superhuman reflexes and unstoppable physical strength. Life before she had a relentless thirst for blood... life before she became a vampire. All Bree knows is that living with her fellow newborns has few certainties and even fewer rules: watch your back, don't draw attention to yourself and, above all, make it home by sunrise or die. What she doesn't know: her time as an immortal is quickly running out. Then Bree finds an unexpected friend in Diego, a newborn just as curious as Bree about their mysterious creator, whom they know only as "her". As they come to realize that the newborns are pawns in a game larger than anything they could have imagined, Bree and Diego must choose sides and decide whom to trust. But when everything you know about vampires is based on a lie, how do you find the truth? 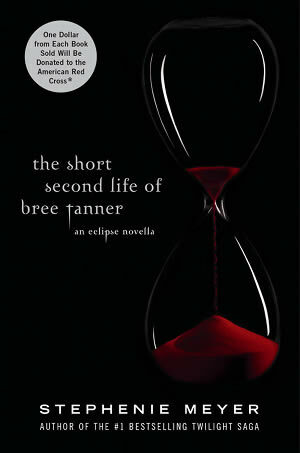 Stephenie Meyer strikes again, this time with a novella detailing the daily lives of the newborn vampires. It was an interesting idea, to see how the rogue vampires lived, but not so extremely interesting that it made up for the other problems with the book, and not executed correctly to make me like the book. My first issue with this book was the characters. More specifically, Bree and Diego. It really bothered me how they only knew each other for a about two hours, and suddenly they were holding hands, and then they kissed, and then Bree felt something irrevocably change in her, suddenly knowing there was a bond between her and Diego, and they are meant to be together. There was no build up to their relationship that could possibly justify something like that. In the blink of an eye, they just were. I would have liked to see more of a romantic development before that happened. And anyway, Diego disappeared after the first 60 or 70 pages. Also, why do authors feel the need to make their Hispanic characters say something in Spanish, even though no one else in the book speaks Spanish? Is it a political statement or something? As a Hispanic myself, I actually found it annoying for Diego to say “No estoy cemando, I’m not burning.” He just repeated the same thing twice in two different languages for no reason. Bree doesn’t speak Spanish, so what was the point? Maybe Stephenie thought it would emphasize the fact that he was Hispanic. Plot-wise, the entire novel was completely superfluous, personally. I could have just read Eclipse and been done with it. The Short Second Life of Bree Tanner didn’t tell me anything I needed to know beyond what I already did, and more importantly, didn’t keep me intrigued enough. I knew how it would end, but I was hoping for a better ride on the way down. Overall, I didn’t enjoy this book as much as I wanted to. It just didn’t work for me, and I’m actually very sorry for that. But on the bright side, it was for charity. The only redeeming quality from this book was one character whom I wished had a larger story arc, and that was Freaky Fred. He could have given the story the fire it needed, but alas. No dice. Well, this doesn't sound any better than I expected it would. If you're going to tell the story from another POV, you really do need to add something new and interesting. Otherwise, what's the point?